Editor’s note: With the U.S. soccer team playing a qualifier in Mexico City Tuesday, we thought we’d rerun this Simmons column from four years ago, when he made his first trip to Estadio Azteca for a U.S.-Mexico qualifier with similar stakes. This column originally ran on August 17, 2009. 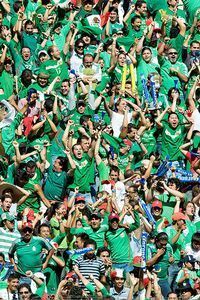 On the day of last week’s World Cup qualifier between the United States and Mexico, a Mexico City newspaper polled citizens asking if they felt the country’s national pride was at stake. Seventy-six percent said yes. Think about that for a second. Americans are obsessed with sports. We currently sustain four major professional sports leagues, as well as NASCAR, the MLS, MILS, the WNBA, every conceivable NCAA sport, dozens of golf and tennis events, boxing and UFC cards, the WWE and even the Little League World Series. Can you remember a sporting event making us feel as if our national pride was at stake? Me neither. Take all the sports we care about here, mix that passion together, condense it into one mega-sport, and you’d have soccer in Mexico. Had the U.S. crushed Mexico’s Cup chances in the legendary Estadio Azteca last week — that’s right, the U.S., the big bully to the north, a country that doesn’t care about soccer even 1/100th as much as Mexico does — it would have been a national tragedy. Maybe it’s not amazing that 76 percent of the people felt as though their pride was at stake because the number wasn’t higher. I flew down to see our suddenly promising U.S. national team tested by an antagonistic crowd. This wasn’t a must-win by any stretch; more of a litmus test. Could the Americans keep momentum going after the team’s astonishing performance in the Confederations Cup? Should we start getting legitimately excited about South Africa next summer? Beyond that, what the hell was happening to me? Why was I starting to get hooked by soccer — a sport I have never totally liked and even actively hated at times? Was this an extremely early midlife crisis? And if so, why soccer of all things? Couldn’t it have been a Porsche or an 18-year-old Starbucks barista? Wait, am I saying that out loud? The good news? My trip to Mexico quickly morphed into one of those “I’m going to remember everything that happened 40 years from now” trips. I stood on the field at Azteca, grabbed a few strands of grass and put them in my wallet. I rode in SUVs with bulletproof windows and security guards. I asked a hotel concierge if there was a good place to get coffee, followed by him pointing me toward a Starbucks to our left, then saying, “Whatever you do, don’t go right.” I got trapped in one of Azteca’s oppressively hot elevators and saw my life briefly flash before my eyes. I watched one of my bosses get nailed by a flying burrito after the game. I drank enough tequila to kill Salma Hayek. I got rocked by Montezuma’s revenge on the way home, which was strange because I am absolutely positive I have never done anything to Montezuma. and with reason. The stands hug the field, shoot straight up and couldn’t be more intimidating, especially in the corners, where fans shower opponents with beers, sodas and LTYDEWTKWTA (Liquids That You Don’t Even Want To Know What They Are) on every corner kick. The lower section of the stadium is fenced, with a guarded, waterless moat (seriously, a moat!) with a second fence above it that prevents fans from racing onto the field. Atop the stadium, an uneven half-roof leads to eerie shadows and goofy lighting that seem to change by the minute. You can’t even call it just a hostile environment; it’s more primal than anything. I have only attended two other games in which the crowd’s collective loathing was palpable — Game 6 of the 1986 NBA Finals (Boston fans heaping hatred on Ralph Sampson, who had punched two Celtics in the previous game) and Game 5 of the 1987 Eastern finals (the same treatment for Bill Laimbeer, who had decked Larry Bird the previous game) — and neither approached USA-Mexico. 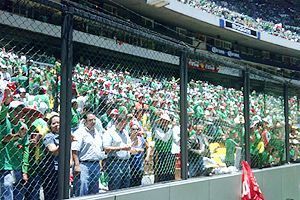 Michael Vick could crash a PETA rally and get a friendlier reception than the Americans did at Azteca. On the worst days in Mexico City, opponents deal with high altitude, intense heat and oppressive smog that makes their lungs burn. (The famous Azteca story that sounds like an urban legend but is actually true: Eric Wynalda once coughed up black blood after a game there.) Mexico passed up a more lucrative prime-time telecast for a mid-afternoon start, hoping humidity, altitude and pollution would wear the Americans down. Nope. The weather settled in the mid-70s. There was a breeze. The skies were so clear you could glimpse the mountains. The U.S. team will never have better conditions for a game in Mexico City. 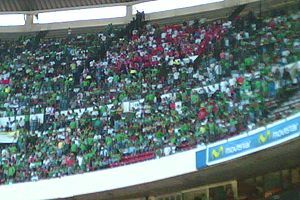 Normally with international soccer games (especially Cup qualifiers), a few sections are reserved for the opposing team’s fans. Not in Azteca. The U.S. was allotted about 500 seats for Sam’s Army (a traveling band of American fans); they were crammed in the upper deck in one corner with armed police officers flanking both aisles. Fans tossed drinks, batteries and rocks at them, then berated them in Spanish, which wasn’t a surprise because this was “Throw Drinks, Batteries and Rocks at American Fans and Berate Them in Spanish” Day. According to one account by a photographer who attended the game, Sam’s Army was advised to flee the premises immediately after the final whistle. You know, just to be safe. Of course, I thought about sitting with Sam’s Army before remembering, “Wait, I have two kids; that’s an absolutely horrible idea!” I landed in a modified suite with a few ESPN bosses, a few more U.S. Soccer higher-ups and my buddy Hopper (the biggest soccer fan I know; I had to bring him). In adjoining suites, Mexican fans were eyeballing us the same way a drunk college football player would stare down someone hitting on his ex-girlfriend. Drinks would crash down on our roof like golf-ball-sized pieces of hail. Did I love it? Of course! Why do you think I wanted to go in the first place? Have you ever gone on a trip where your wife said to you beforehand, “I think you should make a will”? Have you ever been told in explicit terms, “Do not leave your hotel and walk around at night”? Have you ever had someone tell you in all seriousness, “We don’t want to sit in the stands, we would get hit by bags of urine”? Ever mention wanting to wear your team’s jersey into another team’s stadium and have someone answer without a trace of humor, “You should just wear a jersey that says ‘KILL ME'”? This was like a cross between a Raiders game and the Pistons crowd at the tail end of the Artest melee, only if it had lasted three straight hours. I have attended all kinds of sporting events: Never have I heard a crowd more stunned than the Mexican crowd after Davies’s goal. All traces of sound vanished from the stadium. Like someone pointed a remote control at Azteca and pressed “mute.” It was one of those sports moments when you wish they could have stopped the proceedings right there for 20 minutes, just so we could soak in what happened and dream about all the possibilities. 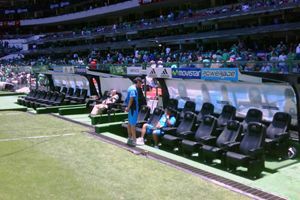 Estadio Azteca. United States 1, Mexico 0. (Pause.) Hold on, just a little bit longer. One more second. Just let me keep enjoying this. 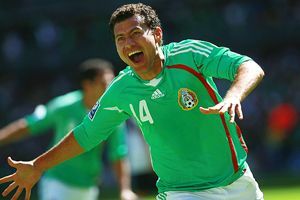 Even if Mexico’s fans didn’t rally right away, its players did. The Mexicans dominated the next 80-plus minutes, finding a flaw in our defense (left side, back middle of the field) and picking it apart much like a basketball offense would exploit an undersized defender in the low post. They claimed this specific piece of turf and made it their own. The Mexicans play a deliberate style, similar to how a football team controls time of possession with a bruising running game and short passes, but they do it with crisp passing and by exploiting mismatches. Their goal? To make the defense overreact. It’s almost like war: attack one piece of turf to open up another. and unfortunately, the Americans lapse into soccer’s equivalent of the one-on-four offense too often. You know it’s happening when they lose patience and forget about controlling the ball; you know it’s happening when they repeatedly sail passes downfield with no rhyme or reason; and you definitely know it’s happening when the defenders seem jumpy. The best soccer defenders clear out a play, then hold the ball for that extra second or two as they size up the field for a counterattack. In Mexico, the jumpy Americans handled these situations like they were dumping a hand grenade. I gotta get rid of this thing! That guy’s coming right at me! AHHHHHHHHHHHHHHH! Thanks to Blanco and some shaky officiating (the Americans couldn’t get a call for two hours), the Mexicans seized control and eventually scored on a hellacious 25-yard bomb from Israel Castro. The crowd regained its swagger. Liquids started flying. We headed into halftime with everyone in my group thinking, I’d take a tie. Secretly, we knew how it would play out. Rattled by the crowd and the referees, the Americans played a tentative, sloppy second half that came back to haunt them at the 81-minute mark, when Donovan (battling the swine flu, although nobody knew it at the time) got badly beaten on a relatively simple streak down the field. His guy ended up creating the winning goal from Miguel Sabah. Game over. The good news for U.S. fans? Our boys hung for two hours in Mexico without disgracing themselves. The bad news? The defeat reinforced some basic problems with our soccer program. We have only a few world-class players (Donovan, Oguchi Onyewu, Clint Dempsey and goalie Tim Howard) and lack a franchise guy who could swing any game, even one being played in Estadio Azteca. For instance, I watched Sunday’s Liverpool-Tottenham battle, and Steven Gerrard was so ridiculously, dominantly good in so many different ways — some overt, some subtle — that I couldn’t get over it. He makes difficult plays seem effortless; you never forget he’s on the field. America doesn’t have anyone like that. Just like in basketball, you can’t win championships in soccer without a LeBron/Kobe-type player. Which brings us to a simple conundrum: America has the best athletes in the world, but only a handful of them play soccer. Had Gerrard grown up here, he would be playing third base or middle linebacker. It’s just a fact. Of the current American stars, only Onyewu (the anchor of the defense) qualifies as something of a physical specimen. That’s what makes forward Jozy Altidore so fascinating. Only 19 years old and built like someone created him in a FIFA 2010 game, you watch Jozy and think, Man, that guy could have played any sport he wanted. Have we ever had a guy like that before? Jozy made his bones in the Confederations Cup, where he posted up a Spanish defender like Tim Duncan, hauled a long pass into his body, shielded the same defender, whirled around (and inadvertently flung the defender to the ground by sheer force), then whipped a bullet by Spain’s goalkeeper for a game-altering goal. If you saw it, you remember it, a LeBron-like, über-athletic moment for an American team normally habitated by realistically talented, ultimately forgettable athletes. If he can make a splash in South Africa, what will that mean for the future of American soccer? For the first time, there’s real hope. You can see it in the eyes of the people running USA Soccer; every time Jozy’s name gets brought up, you see a twinkle, followed by the usual round of “I don’t want to jinx it, and it’s so early, and we don’t want to put any pressure on him” qualifiers. Nothing happened, but the Americans finally have a player whom you can’t take your eyes off of when he’s on the soccer field. Whether Jozy Altidore is ready for that responsibility remains to be seen. Whether there are more Jozys on the way remains to be seen. At least it’s a discussion now. When the Americans play El Salvador next month in Salt Lake City, both Donovan and Altidore should be healthy. Maybe Mexico wasn’t a must-win, but this game is. You can’t give away Cup qualifiers on your own turf. Whatever happens, the stars seem to be aligning for soccer in the United States. Subtle factors have made soccer a potential breakout sport for the next decade: high definition; few commercial breaks; games that almost always end within two hours; improved camera angles; increased exposure to international play; a generation of adults weaned on the 1994 World Cup; even the near-death of passing in basketball, which led people like me to gravitate toward soccer simply because I miss seeing telepathic connections between teammates and will take it any way I can get it. I don’t think I’m alone. Like with succeeding in the game itself, the big-picture situation in America requires patience. It’s not about launching those 70-yard kicks downfield and hoping something happens — a.k.a. the Beckham signing — but building something from within and trusting the process. For the first time, it feels like American soccer might get there. Looking back, the most interesting thing about last week’s game wasn’t whether the U.S. won or lost, but that so many Americans were furious that they couldn’t see the game. When was the last time THAT happened? 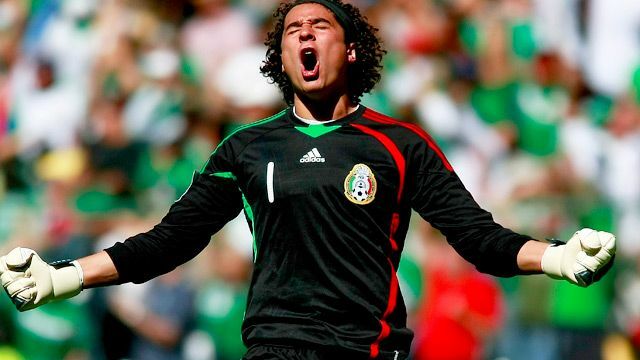 As for the Mexicans, they averted a national disaster and reignited their Cup chances. On the way back to our hotel, driving in our bulletproof car, we passed under a bridge on the highway and noticed one lone Mexican man happily swinging a flag back and forth. He had to have been 45 minutes from the stadium. There was nobody around him. He just kept swinging that flag with a joyous grin on his face. I remember thinking to myself, Nobody in America will ever care about a sport that much. And we won’t.